Up for sale we have a 1970 Oldsmobile Cutlass 442. This is a real 442 that features a 455 engine and gorgeous color scheme. It's covered in the Classic White paint that's accented by the Black Hood and side stripes. Also, it has the Black vinyl top that's in great condition. The panels are arrow straight with the fit and finish being very good. It sports the Air Grabber hood and the correct dual sport mirrors. At the time of the resto new bumpers and other new chrome was installed. The windows were also resealed along with new roof rail seals. All the weather stripping in the trunk and doors was replaced as well. To finish off the exterior it's sitting on a set of Chrome Olds' Rallye's with BFGoodrich Tires. Next, we will look at the interior of this 442. On the inside, it's done in the classic black which flows perfectly with the exterior color combo. As you open the door you'll see the door panels are in great condition with the driver side having the remote mirror. The seats are covered in the Black vinyl with bucket seats up front. This 442 does have the console with the His and Hers Shifter. Looking at the dash it has woodgrain trim to match the console and door panels. It does have factory tach and aftermarket oil and temp gauges were added under the dash. Finally, we will look at the driveline of this Olds. Under the hood, it's detailed nicely with the black firewall and inner fenders. 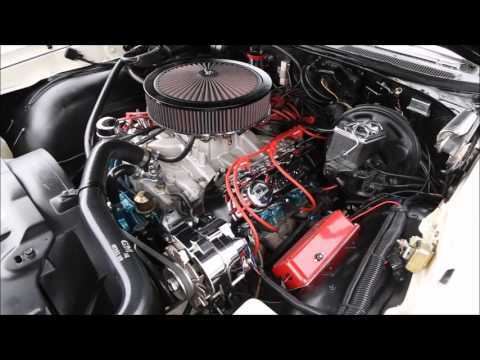 The power comes from the 455 Olds engine that's been upgraded with an Aluminum Intake, Holley Carb, and MSD Ignition. Also it's dressed with a set of Chrome Valve Covers and a Custom Breather. The exhaust flows through a set of Headers with Duals Pipes and Flows Master Mufflers. To keep it cool the radiator was upgraded to Aluminum. This 455 is mated to the 400 Turbo Trans with the stock style 10 Bolt Rear End. Also, this car has Power Steering and Power Brakes with disc up front. When you look under it the Floors and Frame all appear rock solid and have been detailed.